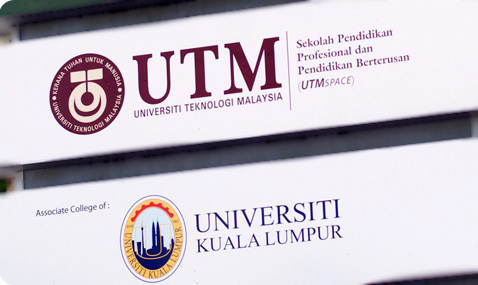 Universiti Teknologi Malaysia (UTM) has appointed Technology College Sarawak (TCS) as its Associate College to offer UTM degree programmes in Kuching, Sarawak. The programmes offered are similar to those conducted at UTM in terms of its curriculum, course management and quality control. At the end of the programme, graduates will receive UTM degree, similar to graduates from UTM. Universiti Kuala Lumpur (UniKL) is a leading university in engineering technology established in 2002. Wholly owned by Majlis Amanah Rakyat (MARA), an agency under the Ministry of Rural and Regional Development, Malaysia, the university is given the mandate to upgrade the status of technical education in Malaysia by the government. As the nation expects more from a technical higher learning institution, UniKL moulds its graduate with strong technological knowledge and astute entrepreneurial skills in order to fulfill the current demand of the industries. UniKL's 14 branch institutes offer various foundation, diploma, undergraduate and postgraduate programmes. With the concept of ‘One Institute, One Specialisation', UniKL contributes not only to tertiary education but also research and development for commercialisation purposes. Strategically located all over peninsular Malaysia, UniKL's branch institutes offer various programmes in their niche areas of specialisation. As of today, UniKL has 23, 620 students and since its establishment in 2002, UniKL has produced 26, 665 graduates.